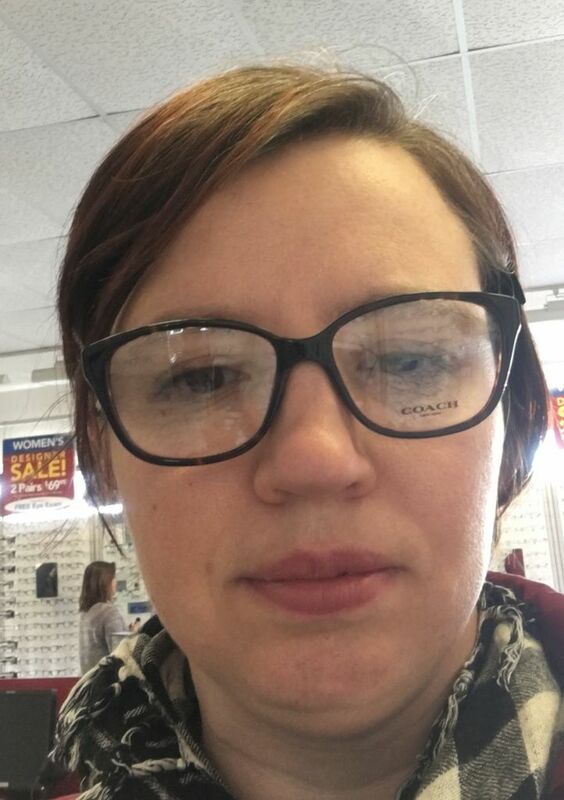 More specs trying on - thoughts? Got an order of specs from Warby Parker. I don't think I'll have time to get an eye exam and get them filled before I leave on a long trip (next week), so I'll have to just catalog which (if any) I like and try after returning. But I thought it a useful exercise anyway. #5 - Are the lenses are too tall (deep?) for me? What are your thoughts? Please tell me if any are brilliant - I'll be sure to write down the size and style so that I can order in March after I return from my trip. (I did find another local store that carries specs, and might even find time to visit. We'll see). Just a couple more outfits showing my current favorites. Pic #1-2: I wore a denim dress over black ponte cropped pants. It was a little chilly to wear bear ankles, so I wore my chelsea boots. These boots have been favorites for a couple of years, but are on their last legs. I'm debating taking them to a shop to see what a re-sole would cost, but have also bought a potential replacement (that wasn't tall enough for this outfit, go figure). 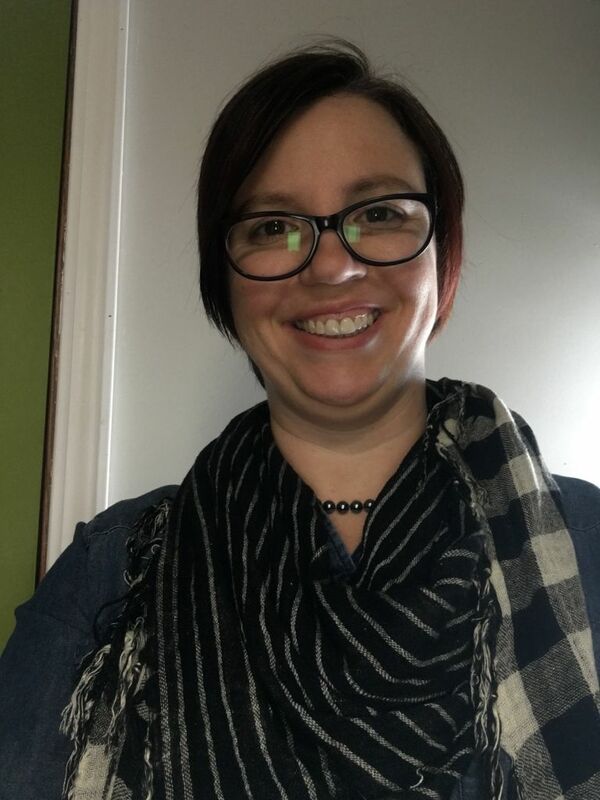 I wore them with a two-sided scarf - and showed both sides for print mixing, and a strand of black pearls. Pic #3-4 I wore the usual WHBM jeans with a mottled dark gray sweater. I love the shape of the sweater - dolman sleeves, a cowl neck and a circle hem. I've already traced it off to copy it, someday when I have the time. (Pardon the lack of make-up and combed hair - I forgot to take another one after I'd finished getting ready). The gray brogues shown are my newest new-to-me acquisition. I've decided that brogues are part of my signature style: I currently have them in black suede, burgundy suede and now these in gray leather. These are the best of the bunch and the most comfortable. Both of these outfits are a little too colorless and too close to black to really delight me. I want to add some warm color to them, I'm just not sure how. I do like these (or I wouldn't have taken their pictures) - I'm just preferring more color in these gray winter days. I welcome all of your feedback, suggestions and comments. My challenge is to wear and document my favorite 30 winter pieces. I haven't completely decided whether scarves count as individual pieces, nor footwear. 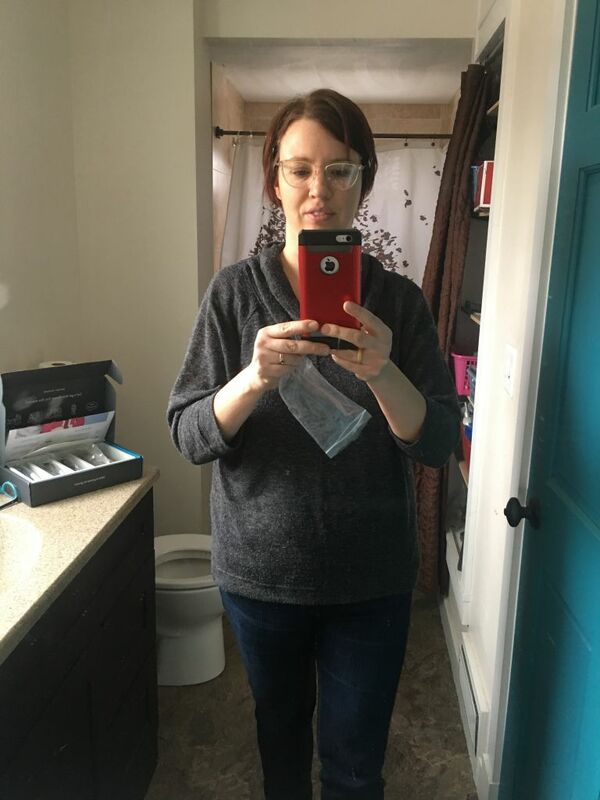 Yesterday I wore my "perfect jeans" again (the WHBM ones that Angie started the lemming trend for), and paired it with a super-casual sweatshirt, that has an interesting shape and texture. I added more texture through the fuzzy cowl-scarf (to keep my neck warm) and black leather boots. I'm gonna get to 30 way too soon. I'm shopping for new specs, though not sure that I'm really going to buy soon. I need an update to my prescription, but it's not super urgent. Still, I'm starting to look. I went shopping a few days ago, and tried on a few. It turned out that I was limited to men's specs, because my head and the bridge of my nose are quite large. So all of these pictured are men's. These are ones that I liked. Are any of these terrific, or should I keep looking? #1 Coach. I like the shape, but the big logo on the arm kinda turns me off. They're brown. #2 Izod. These were probably my favorite pair in the store upon first trying them on. They're dark red. #3 Carter. I'm surprised by how well I like the tortoise shell in the picture, usually I prefer solids, but I like it here. #4 Another Carter - these are brown. #5 - #6 And a third Carter (I liked how this brand followed my eyebrows). These look black in the picture, but I think they were actually a dark brown. I don't think I want black specs, so they're probably out. When I first saw this ensemble, I thought "Too bad I don't have those colors - they're so pretty together". Then I was trying to decide what to wear this morning, and my neon pink pants jumped out at me. I decided to try out pairing them with this brick-red (almost rust) mesh sweater, and liked the result. I paired it with a bronze necklace and bronze-toned sandals, and carried my cognac back pack. Thanks Angie for the idea! My family and I went camping from Memorial Day to July 4th. (34 days, and no, not "real" camping - we stayed in our camper, which has electricity and a flushable toilet, with a bath house nearby for water. We also used the camp kitchen). We had a great time, learned some lessons, and sorely missed the internet. Upon returning, I checked in here, and noticed all the talk about 30x30. It made me decide to count. I had taken (and worn) 32 pieces for the 5 weeks. Granted, I had only two lifestyle needs to cover: getting dirty playing in nature, and seeing-people casual. (There was one wedding, but it was also casual). 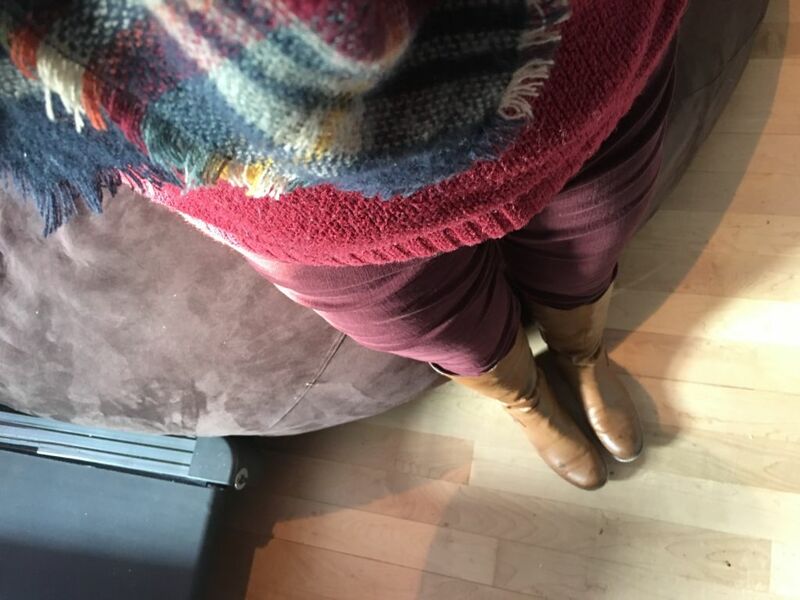 The weather varied from in the 40s F to in the 90s F.
I didn't get much for outfit pictures, but did have some thoughts on the experiment. 30 pieces was close to enough. With less variance in the weather and a more casual than "grubby" lifestyle, I think I would have loved it. I didn't count one scarf and two pairs shoes. If I had, it would be 35x34, I guess. My ratio is about twice as many tops as bottoms. I think this is a good ratio for me. When we returned home, I gasped in delight when I caught site of my shoe rack. Endless options! (But in real life, I've continued wearing the two pair I wore camping). Now that I'm recovering and returning to a more normal-for-me lifestyle, I want to try it again. I have picked out my favorites from last month and started. But I still haven't taken outfit photos. I'll have to work my way back into that. In a few days, I leave for two weeks on business (to France - across the ocean for me). The dress code will be smart casual (everyone will be in jeans, but I'm the only female, and I don't want to look sloppy). 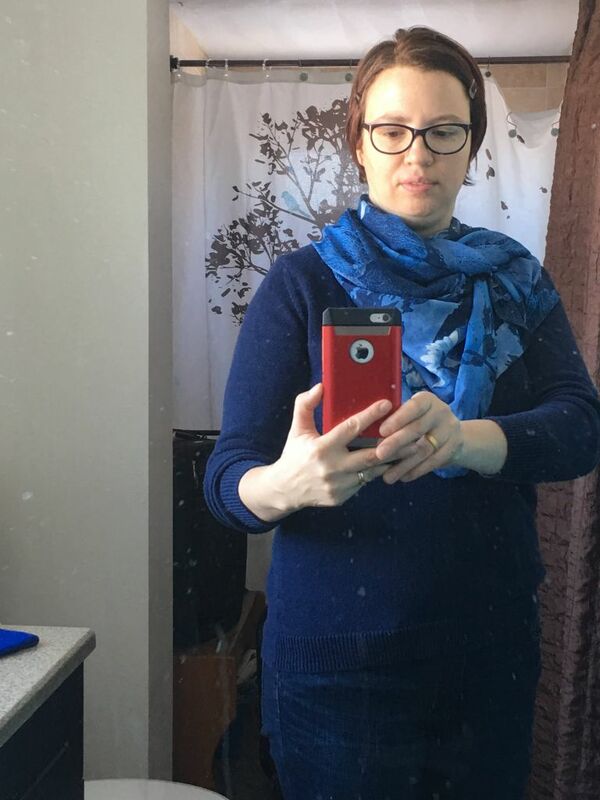 I'm facing a similar challenge to the one LisaP wrote about a couple of weeks ago - my weight is higher than I'm comfortable with it being, and as a consequence, I don't like the way my clothes fit. This makes choosing a travel capsule more challenging, because I'm hoping that the clothes I take fit well enough that I can feel confident, rather than oversized, in them. black cardigan (in finds, embroidered with company logo). possibly black boots (in pic #8 and #9) or another shoe. I haven't decided yet. Here are pictures of the outfits (with my black spiegel jacket standing in for the toppers, which will be arriving to me tomorrow). I'd love your suggestions on which tops to take. I've also been playing with pattern mixing just to have fun. So here's what I've tried. #1-2 black with lace, pearls and a floral scarf (in #1) The shell under the lace is purple, but I don't think you could tell even in real life - so much for adding that bright. #4 This one was a brights-mixing failure in my book. The skinnies are too tight ( sad face ), and the mixed brights didn't look as intentional as I'd hoped. #5-6 Valentine's day pattern mixing with floral pants and a window-pane sheer top. I liked it better with the cardigan (in #5). Pardon the tag showing in the picture. #7 A bright pattern with black. I like this - does it actually work, or am I kidding myself? Is it worthy of putting in my biz-caz capsule? Here's my "kitchen-sink-lite" pattern mixing fun. I've liked bright and bold colors recently, so this combo made me happy even if it's not the most put-together look. Cobalt cords, bright stripes sweater with bold black/white zig zag cardigan. Cardigan is bookended with black/white printed shoes. #1 is how I actually wore it, because I was chilly and liked the print combo of the black and white zig zag over the bold stripes.